2. I received by BA in English and can recognize "good" writing and character development from "bad"
3. I usually avoid the romance and/or fantasy genres. And still...despite all of these drawbacks, I have to admit I became addicted to this series. Set in Forks, Washington, the series centers on Bella Swan, a plucky and clumsy girl who relocates to the rainy city to live with her dad. Everything is going fine until the day she meets the mysterious and gorgeous Edward Cullen. 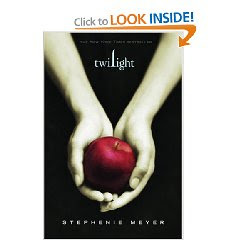 Edward and his family have a disturbing secret that noone but Bella knows about. The series tracks the epic love between the two along with some action between the Cullen family and their immortal enemies. There's also a nicely created love triangle. I am firmly on Team Jacob. The downsides to the series are that it's poorly written, features almost an unbearable amount of teen angst ("I'll love you forever" "No, I'll love YOU forever"), and damn near steamrolls the reader with abstinence and anti-abortion messages. However, agenda or not, in the end, Meyer has created a very powerful story and a memorable cast of characters. This whole series was my guilty pleasure during Christmas and New Years. And yes, I even went to see the movie afterwards. I was the oldest one in the theater.